A sculpture by Gints Grinbergs is on display outside Newton City Hall. 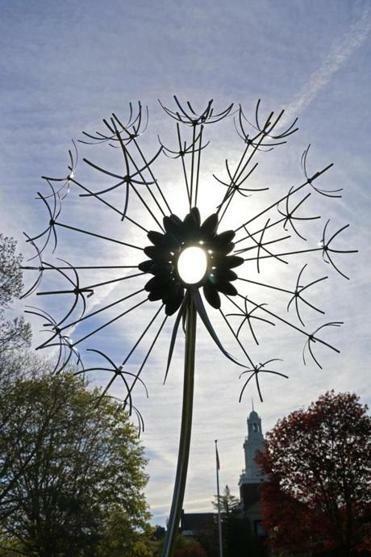 OUTDOOR ART The city of Newton presents an outdoor sculpture exhibition titled “Cadences” now through July 31 throughout the grounds of Newton City Hall, 1000 Commonwealth Ave., Newton. Curators Ralph Helmick and Andrea Foggle Plotkin selected 17 works by Antoinette Prien Schultze, Chloe DuBois, Michael Updike, Joe Carpineto, Kevin Duffy, Sidney Hutter, Murray Dewart, Brendan Stecchini, Jenny Rangan, Michael Bonadio, Gints Grinbergs, Peter Dellert, Paul Angiolillo and Bruce Hathaway. For more information, go to www.NewtonArtsCalendar.org. IF IT’S BROKEN, FIX IT On Saturday, June 10, from 11 a.m. to 4 p.m. at Littleton High School, 56 King St., Littleton, the town’s Rotary Club and Sustainability Committee join forces to offer a Repair Café. Guests are invited to bring broken or damaged household items such as toasters, lamps, hair dryers, clothes, bikes, toys, crockery for repair by expert volunteer handymen and -women. Part of a movement started in the Netherlands in 2009, the Repair Café is intended to cut down on waste while also promoting community collaboration and empowerment. For more information, email littletonrepaircafe@gmail.com. WINE TASTING GiveBackTime will host its first Wine and Spirits Tasting Fundraiser, called “A Taste for Giving,” on Friday, June 9, at 7 p.m. at the Arlington Sons of Italy, 19 Prentiss Rd., Arlington. GiveBackTime is an Arlington-based nonprofit that connects local nonprofit organizations with volunteers and provides a software toolkit for event management, volunteer tracking, and data gathering. Ten wineries and spirit distillers will offer samples of their finest labels. The evening also includes a silent auction, appetizers and live music provided by the orchestra and band students at Arlington High School. Tickets are $55 in advance/$60 at the door. They can be purchased online at bpt.me/2943000 or by contacting tickets@givebacktime.org. ON STAGE The West Stockbridge Chamber Players will perform Sunday, June 4, at 7 p.m. in the Lutheran Church of the Newtons, 1310 Centre Street, Newton Centre. The concert features compositions by Barber, Higdon, Tate, Dvorak and Golijov. Proceeds benefit the Instrumental Music Enrichment Program at Lincoln-Elliot Elementary School. Tickets are $25 adults and $10 students . Reagle Music Theatre of Greater Boston will open its 49th consecutive summer season with the musical “Joseph and the Amazing Technicolor Dreamcoat” for eight performances from June 8 through 18. The show takes place at the Robinson Theatre, 617 Lexington St., Waltham, starring country recording artist and American Idol alum Ayla Brown as the Narrator. Tickets are $37-$65, with senior, student and group discounts available. To purchase tickets or to see a complete performance schedule, visit www.reaglemusictheatre.org or call 781-891-5600. AUTHORS, AUTHORS EVERYWHERE Waltham artist Suzanne Hodes, who co-founded the group “Artists for Survival” in 1981, will read from her new memoir “Studio Days” at the Lincoln Public Library on Saturday, June 10, from 2 to 3:30 p.m. In the memoir, Hodes shares the personal impact of people, cities, nature, and great social and political disruptions of her generation on her art. The library is located at 3 Bedford Rd., Lincoln. For more information on the artist, go to www.suzannehodes.com. John Trexler’s new memoir, “Tower Hill, The First Twenty-five Years, Selective Memories of a Benign Dictator,” relates the story of the inception and process of building the Boylston destination. Trexler, Tower Hill’s executive director emeritus, will hold a signing and talk to launch the book on Wednesday, June 7, from 7 to 8 p.m. The talk is free with regular admission to the Botanic Garden, 11 French Drive, Boylston. For ticket price or more information, call 508-869-6111 or go to www.towerhillbg.org.